Traditionally held on BYU campus, this year the symposium will be held at the Utah Valley University Sorensen Student Center Feb. 9 - 11, 2012. For more information on the history of LTUE, please click here and here. For the current Symposium schedule, please click here. 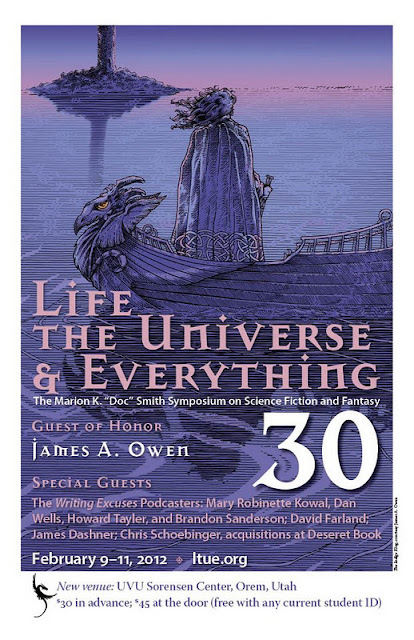 AND if you are a teacher, I'm organizing the Educators' Conference portion of LTUE that will be held on Saturday, Feb. 11th. Visit this link for more info! AND preregistration ends on Monday! And the super real reason for this post (aside from letting you know about the pre-registration)? Is to give you a list of the youth authors and illustrators who will be present! Jenni James (Jane Austen Diaries) edit: Jenni did NOT have to cancel! Yay! You don't want to miss out on this opportunity to meet all of these great people! Here's the link to the book signing schedule. And a new YA author - Morgun Wolf, author of Coren - just released. Thank you! I just added it. Great insight on this symposium, Diana. Thanks for the post.